In case you are not already aware of this terrific website, or like me you’d forgotten all about it, I thought I’d share it with you today. I used to use this site with my students years ago and often used it to challenge my own knowledge of various subjects, too. The website is called Freerice.com. 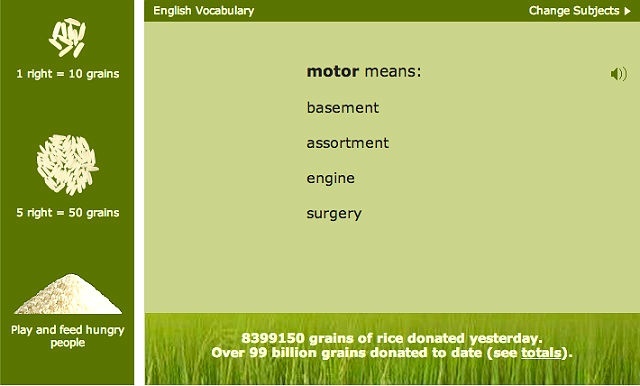 It is s a great site that not only offers a fun and interactive way to improve your knowledge of English vocabulary and grammar (as well as many other subjects), but also enables you to help feed poor and hungry people all around the world at the same time. 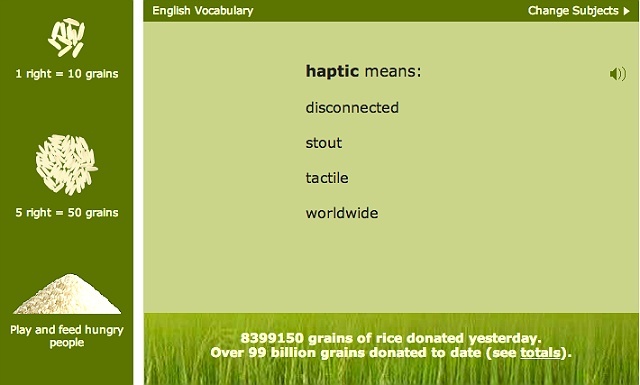 The site tests your knowledge with word quizzes and promises to donate 10 grains of rice through the World Food Programme every time you answer correctly. The prime benefits of FreeRice.com are twofold: You get to improve your knowledge for free and the hungry get to eat! When you play the game, sponsor banners appear on the bottom of your screen for every correct answer that you choose. The money generated by these banners is then used to buy the rice. 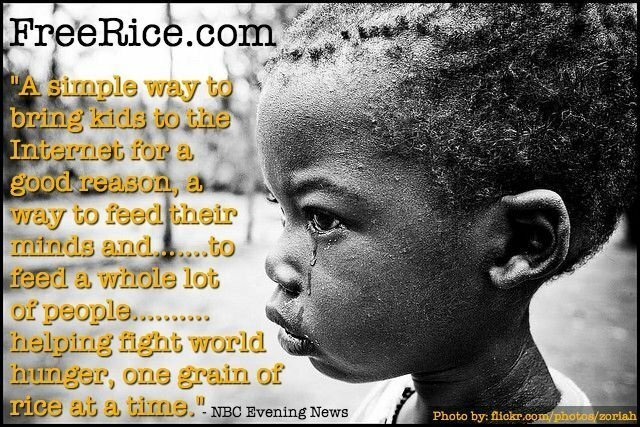 So by playing, you generate the money that pays for the rice donated to hungry people. Once you’ve answered the first question, you will be able to choose your own level. When you get three questions in a row right you will move up to the next level. If you get a question wrong, make a mental note of the correct answer and you will be presented with that same question a short time later. Next time round, you should get it right. And remember, every time you get an answer correct you earn 10 grains of rice, which will help towards feeding at least one hungry person somewhere in the world. Please use the tabs on the left to ‘like’ or ‘share’ this post. Learn all about the Idiom – Blue Eyed Boy? ← What's the Difference Between Inquiry and Enquiry?